'Nduja (pronounced [ˈnduːja]) is a particularly spicy, spreadable pork salumi from Italy. It is typically made with parts of the pig such as the shoulder and belly, as well as tripe, roasted peppers and a mixture of spices. It is a Calabrian variation of salumi, loosely based on the French andouille introduced in the 13th century by the Angevins. 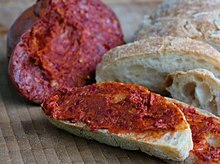 'Nduja is made using meat from the head (minus the jowls, which are used for guanciale), trimmings from various meat cuts, some clean skin, fatback, and roasted hot red peppers which give 'nduja its characteristic fiery taste. 'Nduja originates from the southern part of Calabria, namely from the small town of Spilinga and its neighborhood. It is mainly served with slices of bread or with ripe cheese. Its unique taste makes it suitable for a variety of dishes. For example, it can be added to pasta sauces. ^ "'Nduja Festival of Spilinga 2018". Nduja.org. Retrieved 2018-10-06. ^ Prince, Rose (2011-09-14). "The many uses of 'nduja". The Daily Telegraph. Retrieved 2018-10-06.